5 bedrooms, 2 full baths, sleeps up to 14. Outdoor Hot Tub. Private & Tranquil. INQUIRE ABOUT ONE FREE NIGHT WITH A SEVEN NIGHT STAY! Our family has owned this magical home for 30 years. The locals call our home 'Forest Haus' because of its location and serene setting. We call it our 'Breckenridge Escape' because when we get away from the hustle and bustle of our everyday life it renews our spirit every time we visit. You can't overestimate the value of a great vacation. Our home is a 'difference maker' in that regard! I am sure you have heard the saying 'location; Location; LOCATION'!! Our home offers family style luxury accommodations in a private setting on a 1 1/2 acre lot, with towering blue spruces surrounding the property line and the soothing sound of the wind whispering through the trees. The home is nestled in the White River National Forest with a natural Victorian setting outside and tongue and groove stained birchwood with vaulted, wood beam, family room ceiling inside to provide a comfortable, warm ambiance. We are just a few minutes from the "Touristy" action in the heart of town (skiing, restaurants, shops, nite life) but a quick peaceful escape back to Forest Haus when its time to enjoy peace and privacy with family and friends. Take our tour on this website and see why our mountain retreat can help make your visit a very special & meaningful vacation. We have tried to capture the essence of Forest Haus in our description, but there are intangibles that can only be described by the vacation experience and feeling that Forest Haus will leave etched upon your heart and soul. Enjoy A True Mountain Vacation Experience in Comfort! 'Forest Haus' offers all the conveniences of home, including a full kitchen, utensils, a 47 inch big screen 3D TV, Blue Ray DVD /3D, (bring your 3D glasses!) Sony Play Station 3, Stereo Tuner/CD player, iPod hookup, Wireless Internet, outdoor speakers, washer, dryer, coffee maker, and microwave to name but a few. The dining room is large with plenty of room for large families. Enjoy the views out our door, and the comfort of our hot tub on the deck, sheltered by an open-air roof. The stars and Milky Way are vivid and spectacular in the evening sky from our home. You will also enjoy wildlife vistors in our very personal setting. In the summer, hiking and biking trails are right out our front door. Or relax on the back yard deck to a glass of wine, dine outside on our outdoor dining set beneath the pines, and listen to nature at play. In the winter, use the cross country ski trail out our front door for some gorgeous views up and down the valley or let the kids sled down our hill (we have scooter sleds in our garage). The ski area is just a short five minute drive down the hill from our home and so are the town activities. A Vacation on YOUR TERMS... There are a lot of vacation choices available to you. There are not many that offer the kind of vacation experience that our Forest Haus offers. Vacations are precious and good ones are priceless. You are going to spend a good deal of hard earned money to have a good vacation with family and friends. For me, there is nothing worse than saving your way to a bad vacation. We have tried to make Forest Haus a great value for our guests! Our home is not cheap...but it is not expensive either. We are somewhere in the middle of the pack, but offer the best vacation value. What Forest Haus offers is the optimal blend of true privacy and tranquility along with good proximity to the town below. Have fun downtown when you want to, but when your are done with the crowds, take the short five minute ride back to the house and not worry about 'noisey' and /or 'nosey' neighbors. You don't have to share our hot tub with anyone accept those that have joined you on your vacation. You don't have to sit in a hot tub and shake hands with 'bubba and the boys' sitting in another tub on the deck right next to yours! Does this sound a bit 'tongue in cheek'? Yes, ...probably...but it is a lot closer to the truth than you might think!! Not many homes in the resort offer the kind of privacy that Forest Haus does. Many are built so close together, you can reach out and touch your neighbor. I live in a house packed neighborhood day to day in Denver. When I go to Breckenridge, I want to escape to the mountains....not another jam packed housing community. Check Out Our Story...: Experience nature close up. The starscape at 10,500 feet is incredible and like no view you have ever seen! Sitting in the hot tub and looking up at the stars and the vivid Milky Way is breathtaking!! Our home provides your visit with real privacy; quiet setting in the forest; close proximity to the action; a vacation on 'your terms'...It is all covered in our story about Forest Haus. Give us a call. We would love to meet you. If we can't answer your call, lleave us your telephone number and we will call an introduce ourselves to you. We are friendly and want to share our treasure with great, respectful, fun loving people like you. Our Goal: To provide you with a vacation experience unmatched in the Colorado High Country. I am just like you...I work hard and try to do the right things that help make the slice of the world I live in a better place to be. Forest Haus is my home in the mountains that I like to escape to whenever I get the chance. It is a home I want to share with others that want to have a special vacation. I care about Forest Haus being the kind of home for you to enjoy as much as I do for myself. I grew up on the east coast, went to college in the midwest and found my way to Colorado in 1986. While I call Denver my home, I spend a lot of time in San Diego. My wife lives there! We get to commute between two great cities! It's great fun...and... when she gets tired of me, she just sends me back to Denver! The picture is of Joannie and I.
I bought this property in 1988. I looked at many homes in several ski areas along the I-70 corridor. For me, I was looking for a place that offered an escape from the pressure of my everyday life. It needed to feel right in my gut and in my head. During my search, I found plenty of homes that were nice, but they felt just like being in my own neighborhood in Denver. They were close together and they didn't feel like they were in the mountains. I was looking for something that felt like an 'escape'. I visited Forest Haus several times before buying in 1988. It needed a little bit of elbow grease to shine it up, but the feeling I got and the setting of the home just ignited my soul. So after NOT being able to negotiate a better price, I decided that what I felt in my soul at Forest Haus was priceless. I love the proximity to town and the ease of hiding back in the forest when it is time to leave the bang and glitter behind. Tops on my list of reasons is PRIVACY because I don’t want the “uncontrollables” interfering with my time and enjoyment. I like the freedom of having land and trees all around me. I don’t want to be able to reach out my window and shake my neighbor’s hand. I can do that when I go back to Denver! When I pull up in the driveway of Forest Haus and open my car doors, all the air from my Denver world is sucked out and I am breathing a different dimension of life. If you are looking for a place that will relax you, yet be convenient to the 'action' of downtown Breckenridge, Forest Haus is ideal. It lets you have a vacation on your own terms and offers peace, tranquility and privacy. To me, the feeling of having neighbors 2 acres away with lots of trees in between offers one's spirit more room to breathe and feel free. Forest Haus feels like more of an escape to the Rocky Mountains and an ultimate way to create special memories with those we love. There is only so much of shopping, restaurants and resort nightlife that I can endure. While I do love it, it is far better to leave it behind when I am done with being a tourist and focus more on my family, guests and myself. Your life batteries will get a full charge at Forest Haus! There is something magical about the setting...large towering spruce trees, home nestled, wind whispering through the trees, man and nature together, tranquil...quite zen like. I hope that you will feel the same magic in your heart, mind and soul that I do each time I come to visit Forest Haus. Enjoy! We have a 75 gallon commercial grade water heater which provides plenty of hot water. Our home and water is heated by gas to provide quick recovery on hot water and a comfortable temperature in the home. We have make-up mirrors in the bedrooms to keep bathrooms free for necessities. (Remember, more bathrooms does not equate to more hot water or adequate water pressure in the mountains!! -- we do both well). We are a short 5 minute drive down the hill to Breckenridge Main Street. You can be parked and sitting in a restaurant within 10 minutes. We are a beautiful mountain drive climbing an incremental 700 feet above the town of Breckenridge. Fall foliage is spectacular and the 12,500' Baldy Mountain is the back drop for our front yard! Our home is located 700 vertical feet directly above the Breckenridge Resort Community. It is a quick 5 minute drive to enjoy the tourist "Hustle and Bustle" offered, and an equally short drive back! Our home is built on Baldy Mountain. The area is very private with homes on Acre+ lots. You don't need to worry about neighbors participating in your vacation! Lake Dillon is 10 miles north of Breckenridge. Rent a sail boat or have lunch at the lake front. The Blue River runs through Breckenridge. Enjoy fly fishing! Rafting excursions on the Arkansas River are shuttled from downtown Breckenridge. Peaks 10 and 9 (from left to right) form the back drop behind the 100 - 150 foot pine trees that surround our property. The home sits along side Boreas Pass Road, which was the original rail bed that connected Como and Breckenridge to Denver during the silver mining days of 1882 - 1936. WINDOWS!! At 10,500 feet elevation, temperatures rarely exceed 80 degrees. Night time temperatures are in the 40s and 50s. Escape the heat at Forest Haus!! Warm forced gas heat. Also fireplace / wood burning stove for ambiance and added warmth! Plenty of parking within steps of the front door. Provides access to hot tub controls and storage of items our guests would like safe keeping such as mountain bikes, back packing equipment, skis etc. It does not accommodate parking a vehicle in the garage. Bring your lap top and work from our deck or anywhere in the house. Wood stove with screen insert gives flexibility for added heat or the ambiance of a fire place. We try to have certain staples like salt, pepper and sugar and some common spices, but cannot guarantee they are available for your stay. Take inventory before shopping. After two decades of ownership, I think we just about have everything you would normally find in a kitchen. Plenty of dishes, silverware, pots and pans to accommodate large groups. Dishwasher, large refrigerator, stove, microwave, two coffee makers, toaster...and a partridge in a pear tree (well more apt...Stellar Blue Jays in a Pine Tree). Large Dining Room Table can comfortably accommodate 10. Dining chairs available for 14. Family Room has large screen smart TV. Smart TVs in 3 bedrooms as well. 47 inch Flat Screen 3D capable on Cable with Sony PS3 for games and DVDs. Garden level bedroom has additional 32 inch Cable TV with DVD & Nintendo game set. 3D glasses and 3D movies not included. For listening inside the home, out on the deck and while in the hot tub. Sony PS3 plays games, DVDs, BlueRay, and 3D movies. A large and nice blend of movies for adults and kids. Mountainscape all around you. The home is located in the White River National Forest. Walk around and explore! Boreas Pass Trail Head is a few hundred feet south of our home. See the notes on the Deck. We offer the best of both worlds. Very large with wrought iron dining table and chair set (seats 6) out on the deck. This is a wood deck that in some respects could be considered a huge balcony since the deck is attached to the home and the home sits on the slope of the mountain. Our deck wraps around the home and varies from the distance to the ground from 12 inches to 12 feet. Jack Nicklaus Designed Breckenridge Golf Course is 20 minutes away. Breckenridge Recreation Center offers gym and indoor pool. PRIVATE and PRIVACY! You are nestled in the forest and neighbors are a few football fields away. The trees, features of the home and its layout offer a tranquile setting. You can walk naked to the hot tub and no one will see you... or if they did...they wouldn't care!! The home is clean when you arrive. Additional maid service can be provided for a fee. We have high speed ethernet or wireless connections for your laptop(s). Contact us for the wireless code if needed. Wildlife will regularly visit. It is not safe to try to touch wildlife even if they come to your door! You will get some interesting visitors such as a fox, many species of birds, squirrels, and raccoons. Do not feed these animals (except bird seed for the many beautiful birds that visit) and do not leave open containers of food outside at night. Our driveway is large with parking right by our front door. Daytime summer temperatures range from the high 60s to the low 80s with daytime isolated 'quick' rain showers. Evening summer temperatures range from the low 60s to the low 40s. You do not need air-conditioning in the mountains and likely won't find any homes that have air-conditioning. Wear layers. House was very comfortable with everything you need. Drive was plowed, hot tub maintained , roof and deck shoveled and plenty of firewood. Cozy, well-equipped private gathering haven for family group or couples. Our winter family gathering was all we could have hoped for and would come back again, in any season. Owner most amenable and ever-available. A grand experience all the way. We enjoyed our weekend in this house. One of the bed’s legs was broken when we arrived, but the owner was very responsive and happy to help. Awesome spot right next to snowshoeing/hiking trail and very close to Breckenridge Main Street. When our guest contacted us about the broken leg on the bed frame, we had our caretaker purchase and install a new frame. We try our best to ensure our guests' comfort. Spacious, affordable, warm, well equipped, with a great location! We stayed at Ben's home for a ski week and retreat for a group of 5 men. Each of us could have our own bedroom in this large but cozy home, so that worked out great for us. The kitchen is large and the fridge (looks new) is high capacity, so we were able to eat in most nights to help save $. The home was spotless. Can't say enough good things about Breck and all the recreational activities it has to offer. The home is also a very short walk from the trailhead of a very popular skiing and snowshoeing trail (converted RR grade with amazing views). Ben was always available for questions, and the home instructions were thorough and accurate. Highly recommended! The house was perfect for our group! We were able to cook family dinners and enjoy the beautiful views. The drive was close to town and not too far from activities. The house had great amenities, great heater and warm water! The owner responded promptly to any questions. Would highly recommend. Quaint, cozy home for our friends to spend the weekend together in. Not too far from the bus stop, great hot tub, and beautiful scenery! 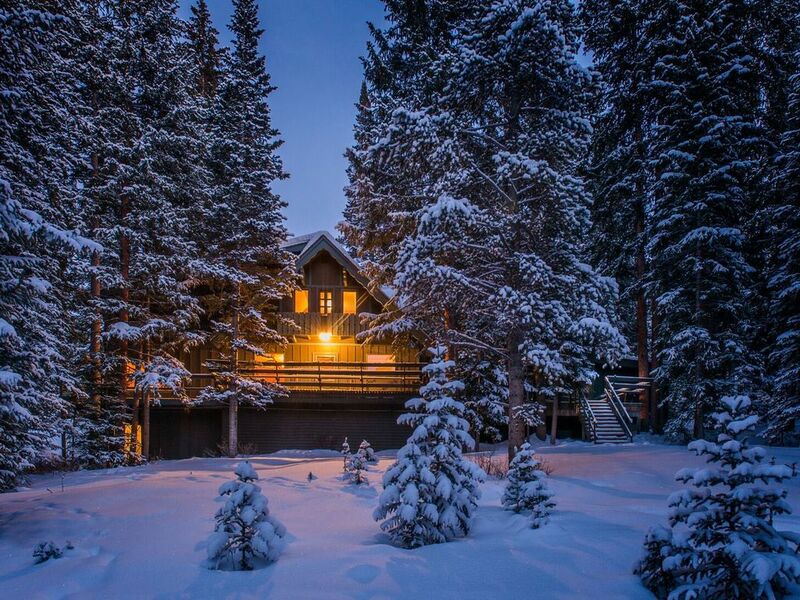 Our home is nestled in the White River National Forest on 1 1/2 acres near the historic trail of Boreas Pass and looks across at the Breckenridge ski area, Peaks 9 and 10. It is less than a 5 minute drive down to Breckenridge Main Street, from our vacation home, where you can have fun with all kinds of activities. Out our front door you can cross country ski in the winter and go sledding on our hill in the back yard. In the summer you can hike/mountain bike the historic trail head by our house. You can shop, dine, enjoy festivals and dance to live music; ski, snowmobile, sleigh ride and ice skate for your winter sport; raft, sail, play golf, hike, horseback ride or do down-hill summer activities at Peak 8 (alpine slide) for your summer activities. There is much more to do and a lot to explore on your own! But the best part is that you can enjoy all of these activities on your terms...because when you are finished with your activities, the peaceful and serene setting of our vacation home lets you relax, enjoy and share the memories of your day without any interferences! Golf: There are several great courses to choose from in Summit County. Breckenridge, Keystone, Copper Mountain and Dillon/Silverthorne all have tremendous courses to play. All courses are 10 - 25 minute driving distances from Breckenridge. Ski: From our home, you can see the upper portions Peaks 9 and 10 as a back drop to the towering pines that surround our property. It is a quick 5 minute drive down the hill from our home to the Peak 9 ski area and the middle of town. Our home is located 700 vertical feet directly above the town of Breckenridge on the east side of Main Street. You look across at the ski area which is on the west side of Main Street. Ask us for more details to help make your visit the best possible!